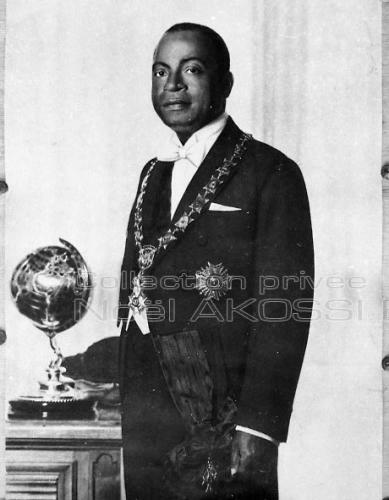 Here is two meters of a pagne featuring President of Cote d’Ivoire Félix Houphouët-Boigny (1960-93). 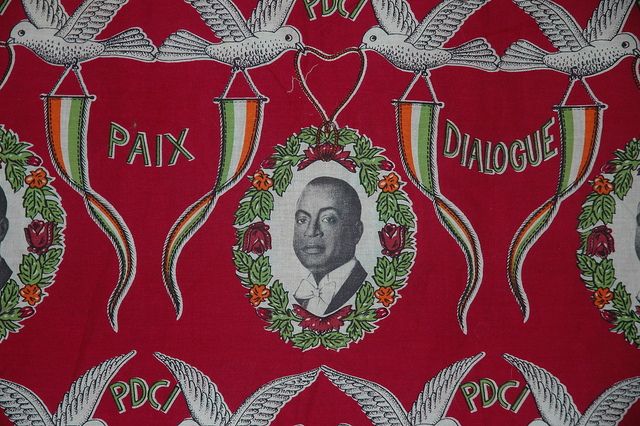 It shows the slogan “Peace, Dialogue” of the Parti Démocratique de la Côte d’Ivoire — Rassemblement Démocratique Africain, PDCI-RDA. Wine red, with dark red, orange, green, the last two forming the tricolor national flag. The image of Houphouët-Boigny is a quite common one, an official state portrait taken after either his November 1960 Presidential election or the August 1960 independence as Prime Minister, and used in stamps and other official purposes. The style and content suggests this is from between then and the 1965 elections at the latest: it would seem outdated in 1970, 1975, or 1980. There’s no printing on selvage edge to give any further clue. Houphouët-Boigny, from beginning as a powerful anti-colonial leader from a chiefly family quickly became a figure of stability and conservatism, in domestic politics, in economic policy, and in his relations with former colonial power France and the Cold War West more broadly. 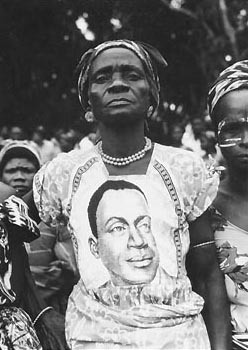 The Rassemblement Démocratique Africain, an umbrella of the most popular pro-independence parties in the former French West Africa, was in the 1940s aligned with the French Communist Party, in part because they were the only French force that seemed willing to work with pro-independence politicians. But Houphouët-Boigny broke with them in the early 50s under pressure from the French government, and the RDA eroded into parties from distinct colonies — soon nations — that allied with the Communists (like Modibo Keita in Mali or Sekou Toure in Guinea), the centrist Socialist Party (like Léopold Sédar Senghor in Senegal), or more center-conservative French forces (like Houphouët-Boigny in Cote d’Ivoire or Hamani Diori in Niger). Houphouët-Boigny — like all but the left — supported French plans for a gradual ‘controlled’ independence, and when independence came his party was firmly in control of the new nation. He set about building a politics of quiet consensus and close economic relations with the French. By the end of the 1970s, Abidjan was ‘the Paris of West Africa’: a glittering center for French business across the continent and rich from Ivorian cocoa, coffee, and timber shipped from its port. Internationally, Houphouët-Boigny led a gathering of conservative former colonies in the Conseil de l’Entente, designed to counter both pro-Soviet states, but also avoiding too much U.S. economic involvement in Francophone West Africa. Houphouët-Boigny remained in power until his death, with the twin firewalls of “consensus” non-political politics and a French military presence as his ultimate guarantee. Compromises, like the welcoming of Burkinabe workers and the papering over of social tensions that followed, set the stage for a national collapse after his death in 1993. His first heir apparent, conservative Prime Minister Alassane Ouattara, fell from favor in the President’s last years, replaced with Henri Konan Bédié. Bédié eventually wrestled control of the ruling PDCI-RDA, and ascended to the Presidency. But the biter fight to retain that leadership involved the creation of an ideology of ‘Ivoirité’ : an ethnic nationalism based on the exclusion of immigrants and northerners, conveniently including Alassane Ouattara. This political maneuver — in which Ouattara’s parents’ place of birth was challenged — succeeded in excluding him from Presidential elections, but opened a pandora’s box of ethnic tensions. Among those unlikely adopters of this ideology was Laurent Gbagbo, a leader of the student movements brutally repressed under Houphouët-Boigny. 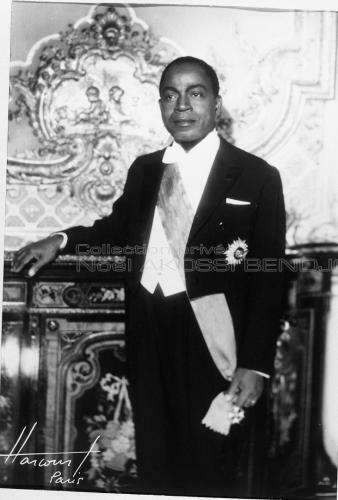 President Houphouët-Boigny’s Official Portrait 1960: the source for the textile. As the economy collapsed and politics became more divisive and violent, coups, mostly led by northern officers, first deposed Bédié (in 1999) , then failed to depose the newly elected Gbagbo in 2002. The decade of bloody division of the country that followed — which included French intervention first to support one side and then the other — was the final destruction of the consensus policy under Houphouët-Boigny. Ouattara is now finally President, the defeated Gbagbo is locked up before an international court, and Ivorians can be forgiven for looking fondly upon the peaceful autocracy of Houphouët-Boigny’s years in power. This textile is particularly reminiscent of that policy: social peace as doves hand Ivorian flags and portraits of the President with heart shaped ties. Flowers bloom amongst the words “Peace” and “Dialogue”, with the PDCI Houphouët-Boigny its guarantors. The rather European “George Cloth” style solid color background and restrained ornamentation matches both his lofty image and the western manner of his dress. Remember, as Ghana and Guinea first became independent in the three years prior, their leaders adopted self-consciously “African” formal dress for all state occasions. 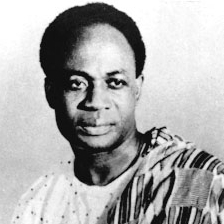 Officials of the Ghanian government at postings across the world were invariably dressed in Kente cloth robes slung over one shoulder for any formal function. But as we can see from the full 1960 state portrait, this is the dress of a President that the French would understand: the equal of any European leader on their own terms. That too is a powerful, if today criticized, strategy. Compare the 1960 photo as well with the somewhat earlier portrait likely taken when — as a successful Member of the French Assembly for over a decade — Houphouët-Boigny was French Minister of State from 1957-61 (yes, even after Ivorian independence he was officially Minister of State as special advisor to the French government). Posed at the Studio Harcourt in Paris, Houphouët-Boigny appears every inch the French political leader he was. His white tie and tails, a French style order — it looks like the Grand-croix de la Légion d’honneur although the Ivorian Légion d’honneur is almost identical — plaque and sash, exemplify power in a way Europeans would understand instinctively. Houphouët-Boigny maintained that image of power on French terms, both for a domestic audience, as for a foreign one. His relative success, as these last decades of struggle in Cote d’Ivoire, ensure this image remains.